So much that you lose somehow turns up again. That’s my one comfort. 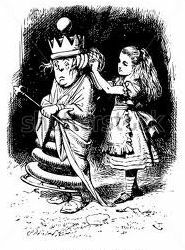 I’m like the White Queen in Through the Looking Glass who, when Alice sees her in the woods, reports that she has lost her comb, while her hairbrush hangs unnoticed from a section of her unkempt locks. I can identify, is what I’m saying, because ONCE AGAIN I have lost my camera. It wasn’t misplaced. It wasn’t left behind somewhere. It was simply rendered invisible as if by some magic spell, and all I can do is hope it might as magically manifest again. I also lost my phone holster and did not find it until three days later when I was rummaging through the fridge. That’s where my keys always are too when they get lost, typically on the third shelf from the top, right next to that jar of salsa. Sigh. Maybe I should just make a list of the things I haven’t lost yet; that might be easier. Well I haven’t lost my tendency to stammer when I have trouble getting a word in. And, I haven’t lost the ability to recite that list of the thorniest Latin verbs in all their forms, though I don’t get much call to trot those out anymore. They say the things that enter your mind early are the things you remember best and I think it’s true. Yesterday in the waiting room of the doctor’s office a handsome man walked in, took a chair and looked me full in the face. Startled, I just looked at him. Now I have not seen Shane McDonough except once, from the back, for almost 50 years. Not since I was deep in 7th Grade love with his older brother and he was the cutest little six-year-old on the block. “How did I know you? You look like yourself!” he said, which to me seemed completely impossible since back then I was basically a jelly doughnut whereas now I have that same pointy-chinned. long-nosed look that Zelda Fitzgerald got near the end of the wild years in Paris when she and old F. Scott were slipping booze into their baby’s bottle, to make sure she got the really GOOD sleep. Look in the clothes hamper. Oh – did they ever find Bill Bailey? Judge Crater? ha ha Judge Crater! Bill Bailey! Once way back as kids, we found our Mr. Potato Head in the clothes hammer, growing more than eyes! look in your bathrobe pocket. right! Maybe there’s a dead critter in there, like the wee rodent Lenny was always patting in Of Mice and Men. When you do find the camera see what kind of pictures the spirit (because it’s always playful spirits responsible for these kinds of things) took. Of course you may need a few shots of spirits yourself in order to see them, but try looking out the corner of your eye. At the least you’ll develop a more exotic look…. Ha! Speaking of looking out of the corner of your eye I’m writing something about the new photo of the Belle of Amherst for tomorrow … Sorry to be so poor a correspondent lately B.